Following in the footsteps of our market-leading M1 Series of mains power surge protectors, the new D1 Series now offers industry leading low let-through voltage combined with the convenience of mounting to a standard 35mm DIN rail. With a choice of LED or innovative LCD display, and opportunity for remote mounting, D1 protectors establish a new benchmark for professional surge protection devices within the electrical marketplace. Enhanced protection to BS EN 62305 - Enhanced protection further minimises the risk of dangerous sparking (leading to flashover and electric shock hazards) as well as equipment damage, compared to standard protection. Repeat protection in lightning intense environments - Protectors offer repeated protection against transient overvoltages, with a 5 year warranty. Compact, space saving DIN housing - Protector housing positions and mounts easily to standard 35mm Top Hat DIN thanks to innovative DIN foot with locking feature. Remote display for optimal protector mounting - Remote displays enable convenient status checking, whilst the protector unit is mounted close to the supply for best practice short connecting lead lengths. Remote monitoring facility - D1 protectors can easily be linked to building management systems, control room buzzers or lights for clear, remote pre-failure warning. Effective fault and pre-failure warning - Advanced pre-failure warning to ensure your equipment never goes unprotected, with Phase loss and N-E supply fault warning included as standard. Designed to deliver the most flexible mains power surge protection solution in today's marketplace, the ESP D1 protector offers both technical and economic advantages over standard Surge Protection Devices. Tested to the latest EN/IEC standards, the ESP D1 protector combines industry leading low let-through voltage with mains Type 1+2+3 protection within a highly compact, maintenance-free unit. The popular 230/400V single and three phase units limit 6000V transient overvoltages to just 600V (Class III test). This level of protection is achieved between all conductors (full mode protection) ensuring all transient paths (common and differential modes) to equipment are protected. ESP D1 series are also available for 120/208V and 277/480V single and three phase systems. A choice of LED or LCD displays is available, with optional remote mounting, to provide easy, hassle-free status checking. The display can be mounted in the most convenient position for viewing and use (e.g. externally on the front of a distribution panel) whilst the compact protector unit sits safely within the panel (mounted conveniently on a DIN rail) allowing short connecting leads to the incoming supply for optimal protection. This flexibility also saves installation time and cost. It's essential that a Surge Protection Device (SPD) provides continuous protection against lightning surges and transient overvoltages. The unexpected failure of an SPD would place electronic systems at serious risk. Therefore, maintaining and monitoring your SPDs is a highly important task. For small scale installations, regular manual checks can be made, however, for larger scale implementations or installations with remote operations, such as telecoms towers or wind farms, a more in-depth control and management process is required. 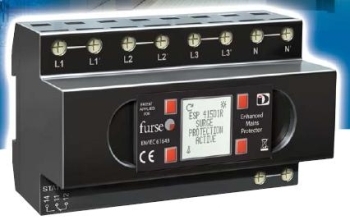 The Furse ESP D1 protector provides the most practical, scalable solution for all such scenarios. ESP D1 incorporates both local and remote advanced pre-failure warning to ensure your electronic systems are never left unprotected. In addition to the protector's own status, the ESP D1 warns of power loss and potentially dangerous neutral to earth voltages. Advanced pre-failure, phase loss and high neutral to earth voltage warning is displayed locally via the back-lit LCD screen, or via LED. For remote failure warning, the ESP D1 can be linked directly or via telecom modem to a building management system, buzzer or light via the Active Volt-free Contact within the unit.